Practice Valuations: Do You Know the Value of Your Veterinary Practice? A valuation of your practice by an experienced valuation expert provides the baseline for future decisions. If you are looking to sell your practice, a valuation done several years prior to the sale allows time for you to make adjustments to boost your practice’s value. If selling isn’t in your near future plans, a valuation can be used to highlight areas that could be improved, providing more profitability and growth for the future. Think of a valuation as a check-up for your business. It will help you see the big picture of your practice. Interest Rates: When interest rates drop and borrowing costs are lower, a potential buyer could afford to pay more. Planning early may allow you to time your sale when market conditions are in your favor. Staff Development: Planning the sale of your practice before the transition time will help you implement a mentorship program for your associates. This process will enable the associate to purchase the practice if they desire, or provide bench strength for the new owner, making the practice more attractive for purchasers. Enterprise Goodwill: A multi-doctor practice where clients are seen by different veterinarians provides enterprise goodwill, meaning the loyalty of the client is with the practice, not a specific doctor. A practice with a good reputation and enterprise goodwill is a less risky investment as it is easier to transfer in a sale. Professional Goodwill: A one-doctor practice has professional goodwill, which means the practice goodwill is tied to the Veterinary Practice Owner. When that owner leaves the practice, the clients may leave when a new owner takes over. A transition plan will be required to introduce the new buyers to existing clients with the goal of reinforcing the skills and professionalism of the new veterinarian. Cash Flow: With veterinary practices, cash flow trends are important. Fluctuations and irregularities from year to year will cause concern for a potential buyer. Financial Statements: If you are running nonpractice expenses (cell phone, vacations, personal vehicles) through your financials, begin separating them so that the practice financials only reflect true practice expenses. Audits: Having strong internal controls and having an outside accounting firm review or audit your financial statements will make your practice more desirable for buyers. A practice valuation provides financial ratios and trends, identifies areas of concern, and highlights areas of opportunity for growth and increased profitability. This benchmark of performance indicators will help you get the most value when you transition out of your practice. 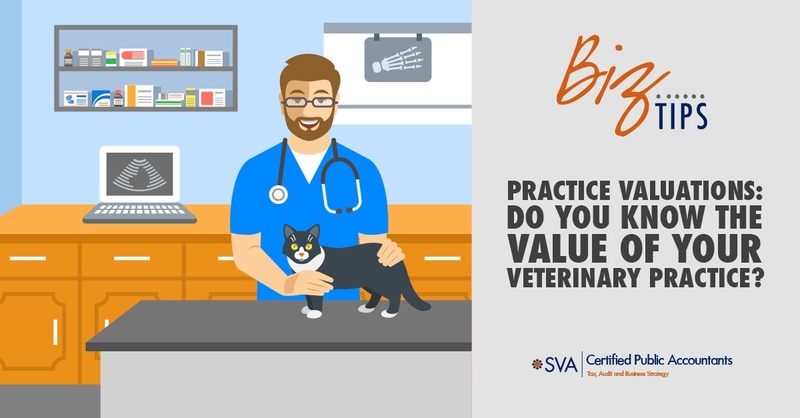 SVA’s Veterinary Practice experts are experienced in valuations and practice transitions. Contact us when you are ready to get started on your practice valuation. Matt is a Principal with SVA Certified Public Accountants, S.C. and a member of SVA’s Healthcare, Dental, and Veterinary Services groups.